The community's first settler, Daniel Reeder, build his cabin on Muskrat Lake, now Lake Missaukee, in 1868. On January 22, 1872, Reeder was the name of post office open and the last name of its first postmaster, Daniel. The county selected Reeder by a one-vote margin as the county seat in 1873. The community became a station of the Grand Rapids and Indiana Railroad. The community was renamed on January 25, 1877 to Lake City. Lake City was incorporated as a village and platted in 1889. The village became a city in 1932. Much of Missaukee County grew in the early 20th century because of the region's timber industry. The community continues to thrive because of local lumber mills. According to the United States Census Bureau, the city has a total area of 1.05 square miles (2.72 km2), all land. 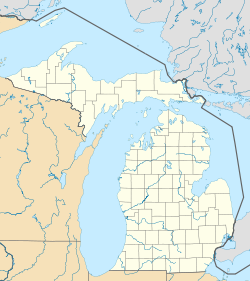 Lake City derives its name from the three inland lakes in or at the edge of the town, which are Lake Missaukee, Lake Sapphire and Crooked Lake. Each is less than a mile from the other. Home of the Greatest 4th in the North. As of the census of 2010, there were 836 people, 337 households, and 216 families residing in the city. The population density was 796.2 inhabitants per square mile (307.4/km2). There were 489 housing units at an average density of 465.7 per square mile (179.8/km2). The racial makeup of the city was 95.2% White, 1.2% African American, 1.7% Native American, 0.7% Asian, and 1.2% from two or more races. Hispanic or Latino of any race were 2.9% of the population. There were 337 households of which 28.8% had children under the age of 18 living with them, 45.4% were married couples living together, 12.2% had a female householder with no husband present, 6.5% had a male householder with no wife present, and 35.9% were non-families. 32.0% of all households were made up of individuals and 17% had someone living alone who was 65 years of age or older. The average household size was 2.35 and the average family size was 2.89. The median age in the city was 40.5 years. 23.4% of residents were under the age of 18; 8.6% were between the ages of 18 and 24; 21.2% were from 25 to 44; 27.5% were from 45 to 64; and 19.3% were 65 years of age or older. The gender makeup of the city was 51.2% male and 48.8% female. As of the census of 2000, there were 923 people, 381 households, and 238 families residing in the city. The population density was 854.9 per square mile (330.0/km²). There were 493 housing units at an average density of 456.6 per square mile (176.2/km²). The racial makeup of the city was 97.72% White, 0.11% African American, 0.43% Native American, 0.76% Asian, 0.43% from other races, and 0.54% from two or more races. Hispanic or Latino of any race were 1.63% of the population. There were 381 households out of which 29.1% had children under the age of 18 living with them, 46.7% were married couples living together, 12.9% had a female householder with no husband present, and 37.3% were non-families. 33.1% of all households were made up of individuals and 15.7% had someone living alone who was 65 years of age or older. The average household size was 2.32 and the average family size was 2.93. In the city, the population was spread out with 24.1% under the age of 18, 9.6% from 18 to 24, 22.5% from 25 to 44, 23.6% from 45 to 64, and 20.2% who were 65 years of age or older. The median age was 41 years. For every 100 females, there were 89.9 males. For every 100 females age 18 and over, there were 86.4 males. The median income for a household in the city was $28,864, and the median income for a family was $34,286. Males had a median income of $27,361 versus $19,044 for females. The per capita income for the city was $17,067. About 10.7% of families and 13.1% of the population were below the poverty line, including 13.7% of those under age 18 and 17.2% of those age 65 or over. ^ a b c "The 18 tiniest cities in Michigan". Flint Journal. Mlive Media Group. December 4, 2016. p. 9. Retrieved December 5, 2016. ^ a b "Lake City Area History". Lake City Area Chamber of Commerce. 2015-12-07. Retrieved 2017-08-16. ^ Romig 1986, pp. 312. This page was last edited on 3 January 2019, at 20:05 (UTC).